LoveLula.com: John Masters Organics Special Offer - Rose Skincare set with Free Hydrating Toning Mist worth £21! 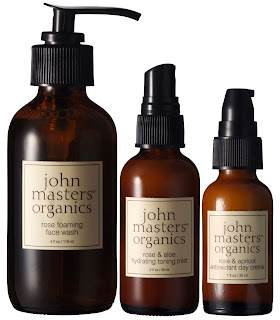 John Masters Organics Special Offer - Rose Skincare set with Free Hydrating Toning Mist worth £21! If you’re not already familiar with the John Masters product range then we have the perfect introduction for you right here. John Masters and LoveLula.com would like to invite you to try 3 of our favourite products within this special offer which contains the John Masters Organics Rose Foaming Face Wash, the John Masters Organics Rose and Apricot Anti-oxidant Day Cream and a FREE John Masters Organics Rose & Aloe Hydrating Toning Mist. All of these beautiful products contain pure, organic Rose Flower Oil to treat, soften, soothe and nourish normal, dry and sensitive skins. With wild-harvested ingredients, cold-pressed and steam distilled extracts, and a strict ban of all petroleum or non-carbon based products; all of the John Masters Organics products provide unparalleled care for your hair and skin. Because only the world’s finest botanicals can make the world’s finest products. These products have now been re-formulated to contain aspen bark which is a new and organic all-natural preservative. With a mix of natural genius and simple human common sense, John Masters (who also just happens to be a celebrity Hairdresser) started making organic products 20 years ago, seeing the need for products that could deliver unsurpassed results using only natural ingredients. This modern day Eco-Hero also runs New York City’s only clean air Hair Salon, which is completely powered by 100% wind energy! Part basement alchemist, part organic innovator, John began mixing organic essential oils and herbs in his kitchen sink. Today, John Masters Organics features more than 30 luxury organic products sold throughout the world. All of the organic ingredients are certified organic by EcoCert, Quality Assurance International, California Certified Organic Farmers, or Organic Crop Improvement Association. So why not take advantage of this fantastic offer whilst stocks last . . ?